Mumia meets with parents of Alan Blueford | Justice 4 Alan Blueford! 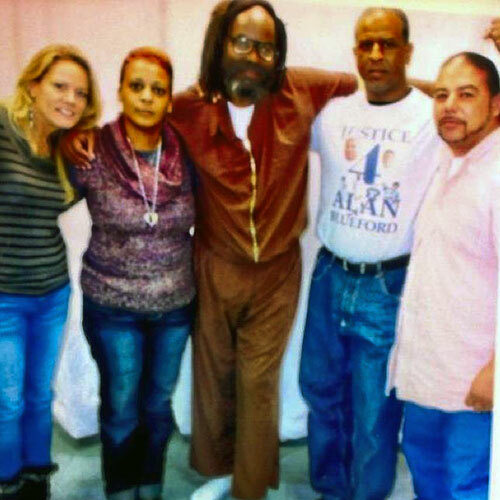 Mumia Abu-Jamal met with Jeralynn Blueford and Adam Blueford, the parents of Alan Blueford, when they traveled to Pennsylvania on Oct. 29 to build support for justice for their son, Alan. The African-American youth was killed by Miguel Masso of the Oakland Police Department in California on May 6. The Bluefords traveled with Jack Bryson, who got involved in the struggle against police repression when Oscar Grant, another African-American youth, was killed on a Bay Area Rapid Transit platform there by the BART police in 2009. Bryson’s two sons were on the platform with Grant when he was killed. The visit was organized by Sandra Jones, a death-penalty abolitionist and assistant professor of sociology at Rowan University in Glassboro, N.J.
Workers World spoke with the Bluefords, Bryson and Jones about the visit with Abu-Jamal, long-time political prisoner, award-winning journalist and former death-row inmate in Pennsylvania. Workers World: Why did you want to meet with Mumia? Jack Bryson: I read all his books and look at him as the Messiah of the movement. In thinking about everything he has been through, who better to comfort and advise the Bluefords? Jeralynn Blueford: I read up on his case. He experienced what I’ve been going through to the tenth power. Adam Blueford: I knew he’s been struggling for justice for many years. Through our struggle, I thought I could learn something from him. WW: What impressed you most about Mumia? A. Blueford: [Mumia’s] heart. He was such a pleasant individual, and me being a religious person, him saying “God is love” is something I brought home with me. His knowledge and his willingness to help. J. Blueford: His calming and soothing presence, coupled with his intelligence and strength. Bryson: He talked about how he loved Huey Newton, the Black Panther Party and Oakland. Sandra Jones: The ease at which he was able to go back and forth between commentary about politics, discussion of Obama to personal confirmation about himself and attention to Jack and the Blue­fords. At this point he has been in general population for less than a year. He had been in solitary for so long. WW: What advice did Mumia ­offer about winning justice for Alan Blueford? Bryson: Don’t depend on the government. Depend on the community and the people. Organize, organize, organize. “Organize with this” [he said, pointing to his forehead]. J. Blueford: Keep fighting. Keep mobilizing. Educating the youth in the struggle is really important. Jones: [Mumia suggested] creating a website “killer-cops.com.” He thought it would be controversial to have that name, but it would draw attention. He mentioned that all the victims could be listed and have a central place to build the movement. A. Blueford: Mumia said that justice is never given, it’s fought for. Not violently, but through education and movements, like the JAB [Justice for Alan Blueford Coalition], which we’re attempting to build. WW: What did Mumia share about his own case and situation? Jones: He spoke about being able to have contact with other prisoners. [He] told about one young prisoner who told him he didn’t “do books.” He now “does books,” and Mumia is educating other young prisoners. He’s able to spend time with Eddie Africa of the Move 9 [To learn about the Move 9, see workers.org]. Eddie has been alone most of the time he’s been in prison. Bryson: When asked, “How do you do this — you’re innocent and [have been] kidnapped?” He said every day he is alive is a victory. WW: Is there anything JAB can do for Mumia? A. Blueford: We want to make sure the injustice done to Mumia is not ever swept under the rug, that this movement we’re building will eventually get justice for Mumia and walk him out of the doors of that penitentiary. Bryson: We should write to him and continue to spread international support for him. WW: Anything else you’d like to share? Bryson: When [Mumia] was 14, he was arrested in Oakland for supporting Huey [Newton]. He talked about Oscar Grant, Kevin Cooper in San Quentin, Troy Davis and Tookie Williams. A. Blueford: Mumia really showed us a lot of love. It was like meeting a family member. … We talked, laughed, hugged, cried — like family. Mumia Abu-Jamal talked about the campaign for justice for Alan Blueford on his Nov. 4 Prison Radio broadcast. Listen to “Tears of Sorrow and Rage” at tinyurl.com/cgha3jx.